James Daniell attended CCOM as part of the GEBCO scholarship program. He has a background in marine geology and geophysics. James has worked for a number of years undertaking marine research within the Seabed Mapping and Characterisation Group at Geoscience Australia. 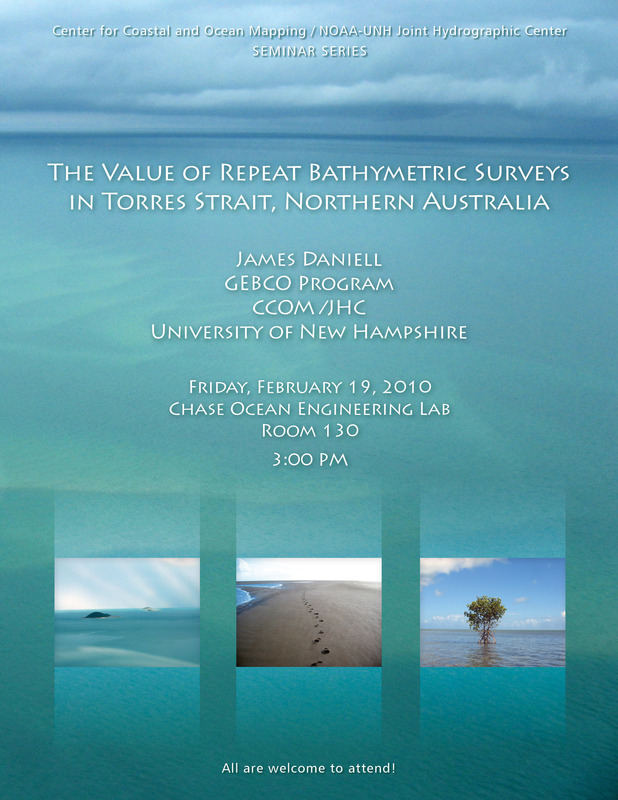 He has undertaken survey work in Torres Strait, Gulf of Papua, Gulf of Carpentaria, and the West Australian continental margin. His research interests include bedload transport, bedform migration, remote sensing, image processing, and most things related to multibeam sonar. He submitted his Ph.D. to the University of Sydney in July 2009. Publications: Daniell, J.J., and Hughes, M. 2007. The morphology of barchan-shaped sand banks from western Torres Strait, northern Australia. Sedimentary Geology, 202:638-652 Daniell, J.J. 2008. The development of a bathymetric grid for the Gulf of Papua and adjacent areas - a note describing its development. Journal of Geophysical Research 113, F01S15, doi:10.1029/2006JF000673 Daniell, J.J., Harris, P., Hughes, M., Hemer, M., and Heap, A. 2008. The potential impact of bedform migration on seagrass communities in Torres Strait, Northern Australia. Continental Shelf Research, Vol. 28, Issue 16, September 2008, pp. 2188-2202. Francis, J.M. Daniell, J. Droxler, A.W., Dickens, G.R Bentley, S.J. Peterson, L.C. Opdyke, B.N. Beaufort L., 2008. Deep-water geomorphology of the mixed siliciclastic-carbonate system, Gulf of Papua. Journal of Geophysical Research 113, F01S16, doi:10.1029/2007JF000851 Harris, P.T., Heap, A., Passlow, V., Hughes, M., Daniell, J., Hemer, M. and Anderson, O., 2005. Tidally-incised valleys on tropical carbonate shelves: an example from the northern Great Barrier Reef, Australia. Marine Geology 220, 181-204.